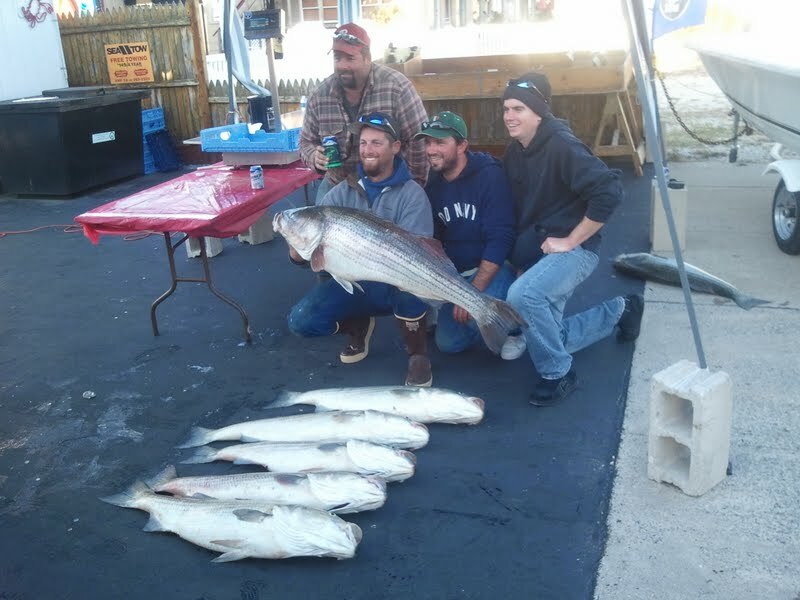 Results from Day two of the Jersey Shore Striper Tournament are in. Lots of fish are being caught. The leading bluefish at this point is 14lb 35in (pic 1) The leading striper (pictured above) is a MONSTER 49.05 lbs and second place isn’t too far behind at 41.8. With nearly 40 fish weighed in so far. Winds look sketchy for tomorrow but hopefully we’ll have another great day of fishing followed by a great evening at the Lobster loft Banquet. 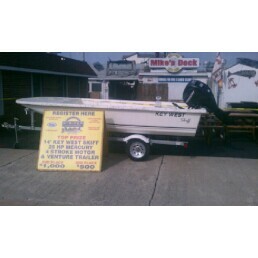 To day is the last day to sine up for the Jersey Shore Striper Tournament. The dead line is the captains meeting tonight at 7 P.M. If you can not make the Captains meeting be shore to contact Jason (609) 778 – 8418. The whether looks better than last year and the stripers and blues are really beginning to CHEW.!!.!! We will be stocked up on fresh bunker fresh clams eels and numerous lures and other terminal tackle you will need for stripper. WOW striper fishing is really kicking in to high gear! !!!!!!!!!!!! 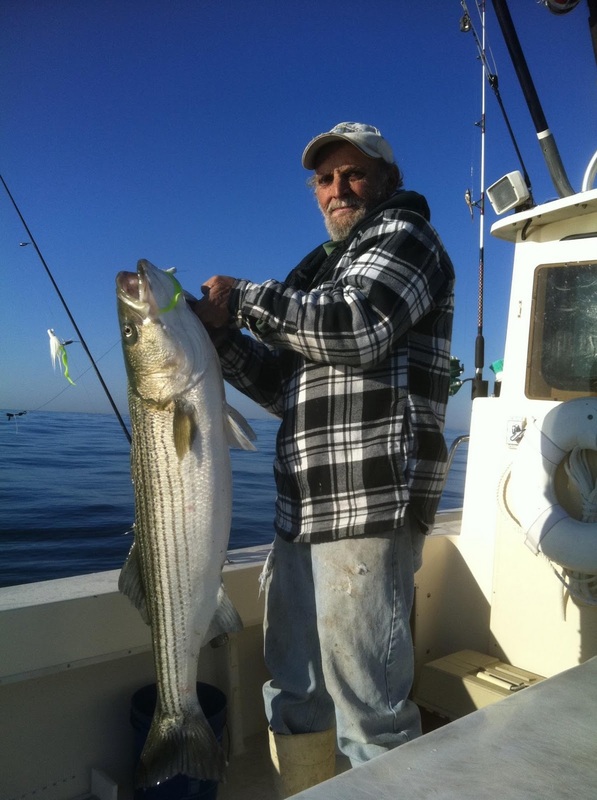 WOW striper fishing is really kicking in to high gear! We have been weighing in fish from the back bay, the beach and the ocean. 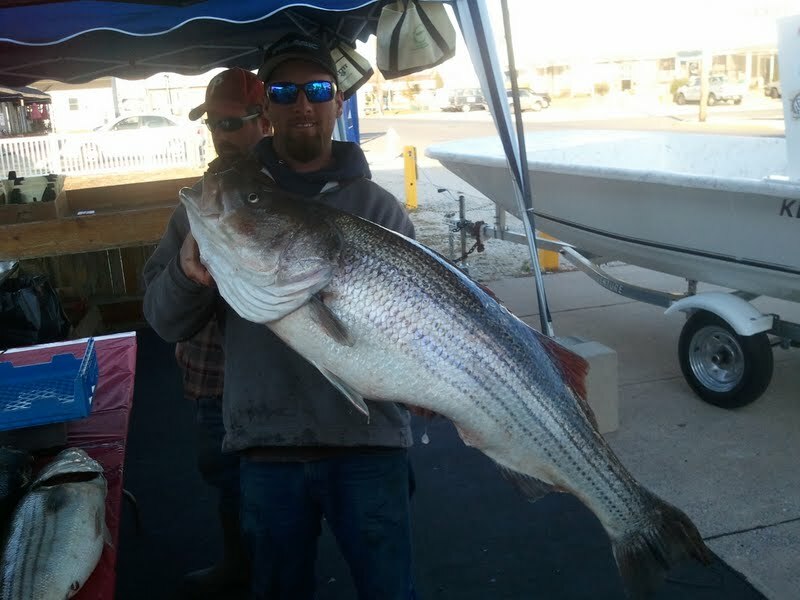 The ocean seems to be producing the most fish right now, they have been catching them trolling, jigging and draging bait. In the surf, the best action is on bait, fresh and salted clams and bunker but the occasional fish has taken Gibbs poppers around the jetties in the am. In the back bay there is fish along the sod banks hitting poppers and slow trolling bucktails or your favorite lure. Dragging eels in a deep hole may produce some of the larger fish. 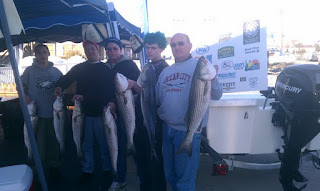 There has also been some nice fish taken in the Deleware bay also.